Photographers worried about carrying cameras that clash with their handbags, fear not: Pentax continues its quest to make cameras that double as fashion statements with the new Optio RS1500. This customizable point-and-shoot offers several means of creating a personalized look for the device, but it also backs up the fun with the same solid specs found in last year's RS1000 camera. The 14-megapixel RS1500 compact camera comes with ten easy-to-apply skins that that fit around the lens and under a lens ring and clear faceplate to give the front of the camera a unique look. 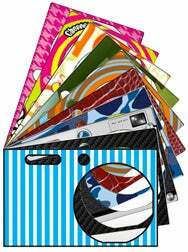 Better yet, Pentax has free PDFs of additional designs available to download at the Pentax Skins Gallery. Users can upload skins they've designed to this gallery for others to enjoy and print. This is all an upgrade from the RS1000's interchangeable faceplate set-up, which required more work to swap out and offered limited custom options. For the ultimate in unique camera-wear, users can download the Pentax Personal Skin Designer from the Pentax website. This Adobe Air-based software allows users to create their own designs and save them as PDFs. Regardless of the origin of the skin, they’re a cinch to apply. No outside tools are required—you simply place the skin on the front of the camera, replace the transparent, acrylic faceplate, and snap a lens ring (it ships with orange and black lens rings) back into place. Aside from its aesthetic features, the Optio RS1500 lists a decent collection of specs. The 14-megapixel camera has a 4X optical zoom lens (27.5mm to 110mm) and a 3-inch LCD screen. Additional run-of-the mill Pentax features are included, including digital filters, automatic face detection, and digital blur removal. The Pentax RS1500 will be ready to ship in April for $150 and is available in base colors of pearl white or silver.